A US designer has won the coveted International James Dyson Award for an innovative bike helmet made out of paper. New Yorker Isis Shiffer's disposable EcoHelmet took the £30,000 ($37,476) prize, which will be used for further development and to help bring it to market. Shiffer came up with the idea while using bike-hire schemes during her time studying abroad in Tokyo and London. "When I was exploring new cities I had no access to a helmet and I didn't want to spend $30 buying one," she told the BBC. Her solution was to create a helmet using cheap, recyclable materials that can be folded away. When its accordion-style shape is fully opened, the honeycomb structure allows the impact of a collision to be spread across the entire design, protecting the head from a blow from any direction. Shiffer tested the helmet at Imperial College in London. As the helmet weakens over time, it only has a limited number of uses. It’s hoped that the final product will come with some sort of indicator to show when it should be thrown away, such as a stripe that changes color or a clip that stops working after a certain amount of time. There are also plans to coat the helmet with a waterproof material such as wax to protect it from rain. The inventor’s ultimate goal is to have the helmets on sale in vending machines at bike-hire locations for $5 each. 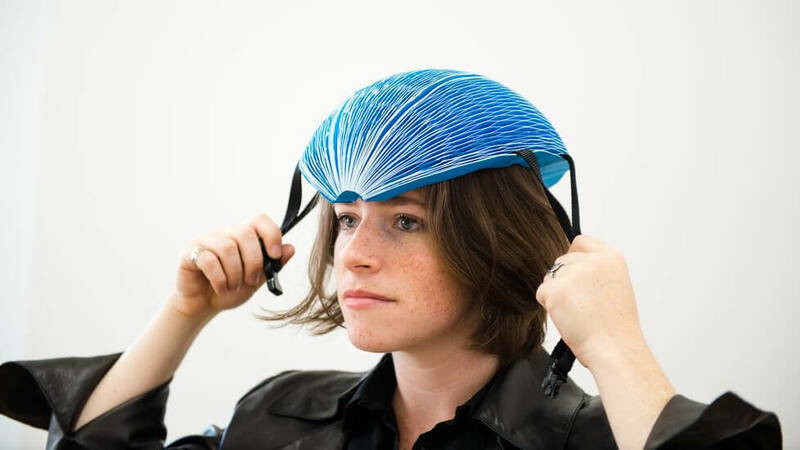 But Shiffer admits that convincing people a helmet made from paper is safe will be a “tough sell.” She’s currently working with a LA firm MemBrain to produce, market, and raise funds for her invention. Sir James Dyson himself is a fan of the EcoHelmet. He said it "solves an obvious problem in an incredibly elegant way. But its simplicity belies an impressive amount of research and development. I look forward to seeing EcoHelmets used in bike shares across the world."